Our products Automatic Pouch Fill And Pack Machines and Automatic Form Fill Seal Machine with Multi Head Weigh, Automatic Form Fill Seal Machine (Collar Type) with Electron, Automatic Form Fill Seal Machine (Collar Type) with Auger, Automatic Form Fill Seal Machine (Collar Type) with Volumetric, Automatic Form Fill Seal Machine (Collar Type) with Liquid, Automatic Form Fill Seal Machine (Pneumatic Type) With Cup and many more items. Specifications Masala Pouch Packing Machine to pack product Masala/ Granular / chips / namkeen using multihead combination weighing with high performance With firm commitment to quality, we are presenting for our clients a vast range of Automatic pouch Fill and Pack Machine that is used for filling pouch by auger revolution count. With the help of our dexterous workforce we are able offer the Jam and Jelly Making Machines to the clients. We manufacture the Jam & Jelly Making Machines with the highly advanced technology to cater the variegated requirement of the customers. When it comes to the construction part, this Jam & Jelly Making Machine is made using the best-grade Stainless Steel or Semi-stainless Steel Body with Scale Ruler for adjusting to the precise production. This Jam & Jelly Making Machine works on the simple principle. Through high speed relative motion of Rotor and Stator, this Jam & Jelly Making Machine gets a strong Shearing force, Friction and High mode Vibration. 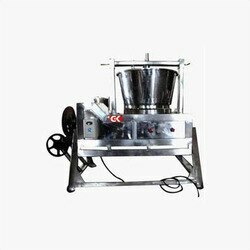 Effective for Crushing, Emulsifying Homogeneity material to become a refined product, this Jam & Jelly Making Machine is used in varied industries. Our Jam & Jelly Making Machines are ideally used in Food industry for preparing Peanut Butter, Soybean Paste, Jam Paste, Cream, Sesame/Tahini Paste, Gingli Paste, Chili Sauce, Almond Butter, Cacao Paste, etc. This Jam & Jelly Making Machine also finds its applications in Chemical industry for the production of Paint, Lubricant, Elestex. Stainless Steel Storage Tank With Stirrer Ask for Price Clients can avail from us an industrial range of SS Tanks with Stirrer. Made from top grade stainless steel alloy, it is designed to deliver optimum performance. Owing to the superior quality raw material, it exhibits features like durability. We offer our range of SS Tanks with Stirrer at most reasonable rates. Leveraging on our technical expertise, we are able to manufacture and supply a wide range of pouch packaging machines. Our team of professionals especially engineers these packaging machines using cutthroat technology and quality-tested materials. Entire range of packaging machines for pouch complies with international quality standards. Pouch packaging machines delivers consistent performance by consuming less energy. Our array of pouch packaging machines is widely acclaimed for their unique quality features such as compact design, robustness and durability. Packaging machines for pouches are available with customized design. Our clients can easily install and maintain our pouch packaging machines efficiently. The use of high quality materials in packaging ensure for defect free transportation of packaging machines. We avail our pouch packaging machines in the markets at the industry leading prices..